We want to remind parents/guardians, students, and staff about White Rock Christian Academy weather-related school closure announcements. 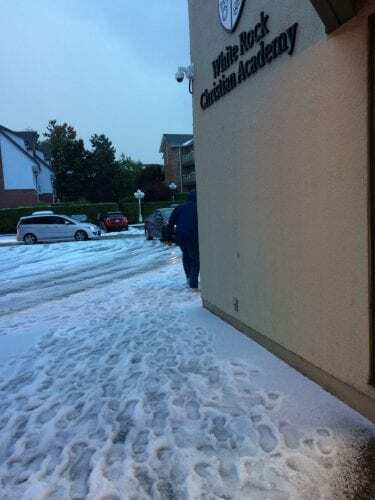 The school will remain OPEN, unless there is heavy snowfall, damage or other circumstances (e.g. power outage) that make it impossible to operate safely. The school will do its best to communicate school closure by 6:30am. If appropriate, the school administration may decide to have a late start at 9.30am. PLEASE NOTE THAT NO ANNOUNCEMENT WILL BE MADE THAT THE SCHOOL IS OPEN – ASSUME THAT THE SCHOOL IS OPEN. Parents/guardians are responsible for their child’s safe travel to school. Please walk elementary children to the door of the school if you are uncertain whether the school is open or not. If for any reason you feel that your child cannot travel safely to school then you should notify the school that your child will be absent. Student safety is a shared responsibility. With your cooperation and support related to winter weather procedures, we can achieve safe conditions for all. The school administration can decide to dismiss school early if weather conditions create a concern for the safety of students returning home. The principal and staff will communicate this decision to parents in the best way possible through the school’s normal communications channels. Please note that once your application has started you cannot save and return at a later time/date. Please set aside 1 hour to complete the full application package. Applications will not be considered complete unless all elements are submitted. Please have the following mandatory documents ready to upload prior to filling in the application form. Copy of parent’s landed immigrant status paper or PR card (if permanent resident/landed immigrant If applicable. A $50 non-refundable registration fee (per applicant to a maximum of $100 per family) is required upon submission of forms. Once you have completed the application form the Director of Advancement will arrange for next steps as well as payment of the application fee. Upon acceptance, an enrollment deposit of $150 per student, for 3 or more students a deposit of $100 per student is required to a maximum of $300. This is applied to first month’s tuition. (Please provide the mailing address and fax number of the last school attended only. This will allow us to send for school records). Should I be found negligent in any of the above commitments, I will accept the appropriate discipline. If I do not demonstrate an enthusiastic willingness to follow the above commitments, I will accept that I should withdraw myself from White Rock Christian Academy. We will endeavour to ensure that our child faithfully obeys all the above commitments. Should our child be found negligent in any of the above commitments, we will accept the appropriate discipline for our child, or withdraw our child from White Rock Christian Academy. 1. I agree with the vision of White Rock Christian Academy. 2. I agree to give one month’s notice of withdrawal; or, in lieu of this, one month’s fees. 3. In matters of discipline, my child(ren) will be subject to the disciplinary action of the staff and administration. I understand that I will be given the opportunity to discuss disciplinary matters affecting my child(ren) with the staff, administration and Board of Directors if necessary. 4. I understand my financial commitment and will immediately notify the office if I cannot meet that commitment. 5. I understand that the school reserves the right to dismiss any student who does not respect the standards of the school or cooperate in the education process. 6. I have, to the best of my knowledge and ability, answered all questions truthfully and completely. 7. I’ve read and am in support of WRCA’s statement of faith. We believe that the goals of White Rock Christian Academy can only be realized if home, school and church are truly an extension of one another, thereby creating a united nucleus from which the student can develop the attributes for Godly character. The following questions are designed to help us in our student/family selection for White Rock Christian Academy. The student’s attitude, conversation, and behaviour reflect the character of the institution from which he/she derives his/her training, both home and school. This form reflects the school’s attempt to help determine where home, school and church can truly be in partnership. Parents and student, discuss and briefly respond to the following question below: Describe what Jesus Christ means to you. Student, please answer the following questions. Describe what Jesus Christ means to you. Describe your commitment to being a Christian. Describe your commitment to your church. Upon acceptance to White Rock Christian Academy, I give consent to the school to collect personal information that may include student identification information, birth certificate, legal guardianship, court orders if applicable, parents’ work numbers and e-mail address, behavioural, academic and health information, most recent report card, emergency contact name and number, doctor’s name and number, health insurance number and any similar information. I also consent to the collection, use and disclosure of such personal information by and to agents, contractors and service providers (e.g. Ministry of Education, Public Health Authority) of White Rock Christian Academy for the purposes listed above. This information is required in order to register your child(ren) at this school and assist the school authority in making an informed decision as to your child’s suitability and appropriate placement in the school. It will also allow the school to respond immediately to an emergency. For more information, please contact the school’s Privacy Officer. 4. I consent to having photographs, video and work samples of my child(ren) used by White Rock Christian Academy in the yearbook, newsletters, website, and other promotional material. White Rock Christian Academy acknowledges that there will be no disclosure of personal information to unauthorized personnel or third parties who are not directly involved in school management or the care, supervision and instruction of your child(ren) at this school, unless written authorization from a parent or legal guardian is provided to the school. The school will securely store all digital and hard copy parent and student personal information. Attach a filled out copy of the Legal Residency of Parents form and applicable documents below. Attach a filled out copy of the pastoral reference form below.